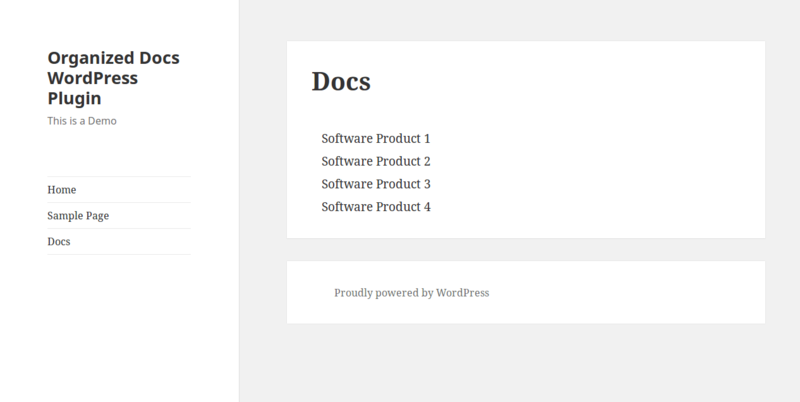 Organized Docs is a WordPress plugin that lets you create documentation for any number of products, organized by product, and by sub-headings within each product. You can use this to create instruction guides for just about anything. You need to create software documentation. You need to create documentation for one or multiple products, and must have the docs organized neatly, by product. You need to write instruction guides for virtually anything, whether it be products, games, topics, etc. You can label them as “Instructions” instead of “Docs”. You don’t want to create a separate website for your docs. You simply want to add them on to your current WordPress site. In any case, you still have to write the documentation articles yourself, but this plugin organizes them into a visitor-friendly, browse-able format that fits right into your WordPress site. This takes the headache out of organizing documentation articles and instruction guides. The main “Docs Page” will list all the products. Clicking on a product will take you to the docs only for that product. 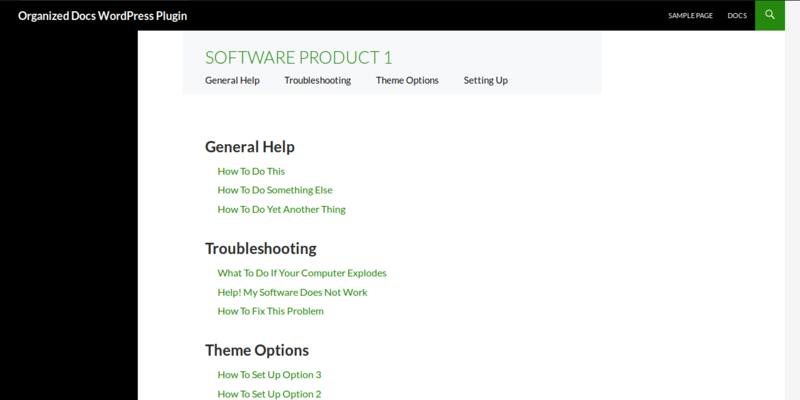 Each product’s docs is further organized into subsections. The subsections list each individual article in that docs section. The single docs posts will have a Docs Table of Contents widget added to the sidebar. This will show a Table of Contents for docs pertaining only to the product which this current single doc belongs to. Documentation articles will have schema.org structured data (microdata). It adds **TechArticle** microdata to single Docs, and **CollectionPage** microdata to Docs archives. You can disable microdata. Organized Docs works on Multisite WordPress installations, as well as regular WordPress sites. Main Docs page listing all main items. Twenty Fifteen theme.